The newly remodeled kitchen offers granite countertops, stainless steel appliances including french door refrigerator, , maple wood cabinets, underground stainless sink, nickel faucets and all utilities you will need for your visit. New pendant lighting surrounds the kitchen and bar seating area. In the living room, new leather sofa, flat screen TV with DVD offers a quiet space for relaxing. Offering sensational beach and pool pools is the huge side view balcony. Enjoy colorful sunsets from this one of a kind vantage point! 203 Crimson has two master suites. The first has a king canopy bed with walkout balcony. The bath includes double sinks, nickel faucets, double mirrors, frameless shower doors and granite counters. The second master has a king bed and walk out balcony. Twin beds, furnish the 3rd bedroom. All bedrooms contain new bedding and comfortably sleeps up to six people. As with every SunHost property, linens, extra towels and pillows are all stocked, and ready for you upon arrival. Washer and dryer, are here as well for your convenience. Across the street from popular John's Pass Village. The Pass is a quaint turn-of-the-century fishing village and Pinellas County's #1 tourist attraction. The Village has over one hundred unique shops, a variety of restaurants, the local fishing fleet, dolphin watching and shelling tours, boat rentals, parasailing and jet skiing. Best of all as a Just a few steps from the beach, swimming pool, hot tub, and BBQ facilities, guests also enjoy being across the SunHost customer you can walk to this great entertainment destination. Anchor tenants include Bubba Gumps, Hooters and Hubbards Marina and also world famous Bamboo Beer Garden. We had an amazing holiday despite the Red Tide. Our condo was beautiful and we will definitely rent it again. However the fake plants in the bedroom and living room are major dust collectors and in need of a major cleaning. I do wish there was an opportunity to recycle at the Crimson but didn't see any spot to leave it. The only other thing we wish was there is a gas BBQ. Crimson is the smallest of three buildings. Very well maintained. It’s a little hard to see the sign from the road but makes Crimson a hidden gem. #203 is 3 bedrooms, 3 baths, spacious and tastefully decorated. There’s so many amenities close by. No car rental is needed. We’re having a great time! The Crimson condo building was VERY well maintained and offered everything we were looking for. 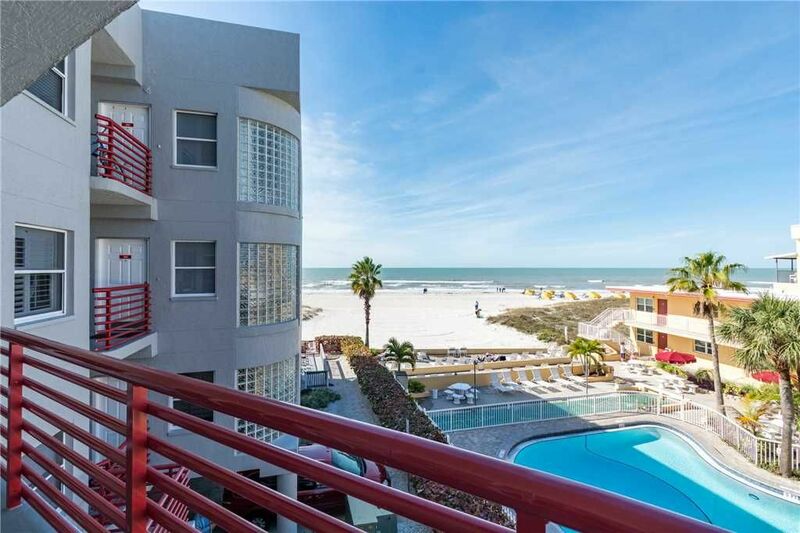 Three bedrooms and three baths in a condo right on the beach and right across the street from shopping and dining options was a great find. The condo was exactly as pictured in the listing. We couldn’t have been more pleased! We had a great stay here in Crimson 203. Very comfortable for all of us. Our grandchildren from the UK really enjoyed the ocean and the pool. The grounds were kept very clean and we were impressed with that. SunHost is not responsible for the condition of the pool, but they contacted pool service several times for the recurring chemical problems due to faulty controls. The ONLY difficulty was with the very intermittent WiFI service. Managed to work around it, but it was frustrating. If a guest needs to do some serious work requiring consistent service, he/she might have difficulties. the sliding doors in the living room and in the second bedroom were very difficult to open other than that everything was just great. Was here for a week and found the condo to be spacious and clean. Great view of the ocean from our balcony. Great location to John's Pass Village.